Today, I come with an interesting stuff for you and let me ask few questions related to it. Do you have some special services at your emerging blog/website? And, do you want to offer them only for those visitors who have account on your blog/website? What will you do if your visitors prefer to use their social media accounts to leave their comment on your webpage? Are you providing a long-signup form for them to get email updates, community support or other exclusives? If you say “Yes” for my questions, then I would say that you’re probably missing a lot of signup from new users and you need something special to avoid losing potential members of your user base. Don’t think that I am taking about a progressive way to convert new visitors into registered users. Many internet users arerunning out of patience to fill lengthy registration process, verify email address and remember new set of username & password. Your visitors might get irritatewith the same and thus you would fail to get good no. of user sign-ups for your websites. Are you a blogger/webmaster who misses subscribers with your prolonged sign-up process? Here is a new start-up for you in the form of plugin that supports social login and would let your visitors to skip a new account creation from scratch.Absolutely, the interesting stuff is LoginRadius, a social network integration plugin for websites and blogs. Let’s have a comprehensive look of this tremendous Plugin through this post. LoginRadius is a Software As A Service (SAAS) that allows users to sign-up in your website using their existing social accounts like Facebook, Twitter, Google and more than 30 different popular web services to eliminate the account creation problem. 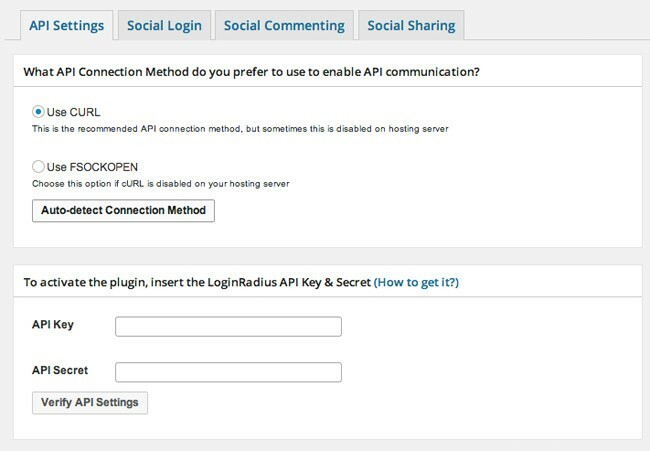 To use this plugin, you need to sign-up for Login Radius service to get an API key and API secret. Then, you could configure your website settings in dashboard but be sure to enter your API keys to confirm that you have exactly sync back to your Login Radius account. LoginRadius take away the need for users to fill a registration form as it allows them to login with their pre-existing social profiles. 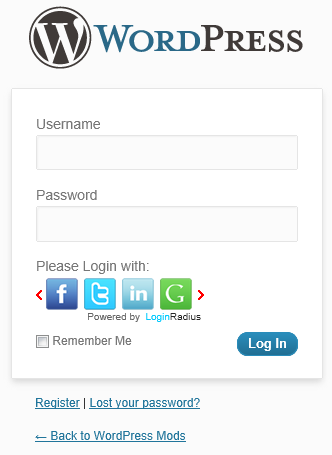 Hence the social login of LoginRadius shortens and simplifies the registration process for your visitors to login to your website/blog, if you need them to register for a membership or to do commenting. Additionally, you could modify your login box in different ways with the multiple options available in its premium features and it is possible to interact with your users in a meaningful way. 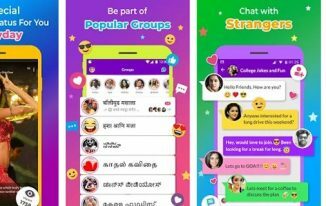 Just choose the different social media services that you want to offer through your social login and it is essential to create an API Key and Secret for the selected services to function properly. Otherwise, you might get some errors while login or the service will not work. After configuring some social services to your word press login (may be any other), it will look like the screenshot given below and work in the same way as your normal login for social commenting. 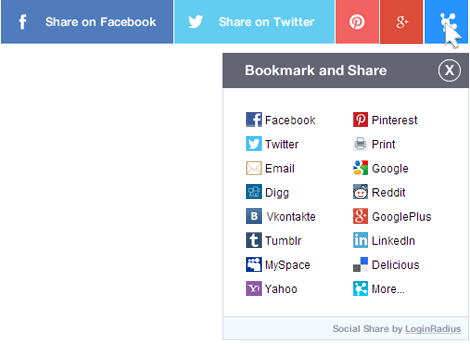 LoginRadius offers 90 social share widgets for your web that would allow your users to share your information on their network. It supports both horizontal and vertical sharing buttons and they can be placed on your homepage, above or below the content and on some other places. 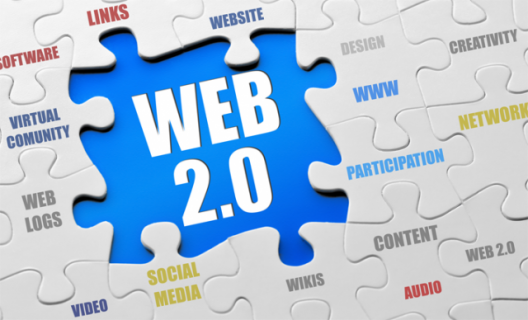 So it will result in a dramatic increase in referral traffic to your website/blog which would finally lead to its incredible growth. To help you better understand your users, Social Analytics of LoginRadius gives a detailed insight on them through some additional parameters. It is better than traditional analytics since it goes deeper into your user behaviours to give clear picture of your social ROI. Users can register to your web space by logging in with their social IDs. It has been developed to function independently on various technological platforms. Clients can customize their social login interface by picking their desired theme and login design from multiple choices. It is a cloud based system and so you need not to take care of maintenance at your end. Maintaining a good social experience on your website is its priority through 24/7 technical support. LoginRadius provides a free trail plan for up to 2500 users with 4 ID providers, community support and basic social sharing widget. It has three exciting premium options in the price range of $8, $99 and $499 per month with excellent features and priority email support. In general, people bounce to create an account in websites because of their busy life and they already have several online accounts. They don’t wanna save different login credentials; forget passwords and retrieving them by getting mails. But they do have social accounts to integrate with your website. 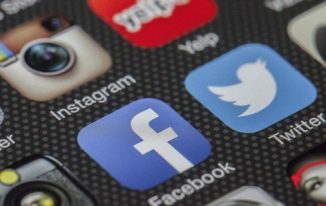 So, it would be good to provide a reliable social login feature to incorporate any of their social profile to use your services or to do commenting. I suggest you to use a powerful integration service like LoginRadius which is being used by 100,000 + businesses to ease social login on their websites. 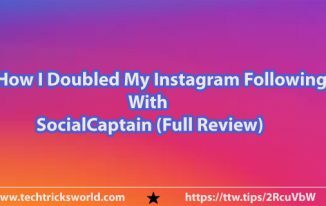 It also provides social sharing feature for your webpages where you can add the famous social share buttons together with a LoginRadius sharing button and thus allowing your visitors to share your content on their social networks, if they wish to do it. 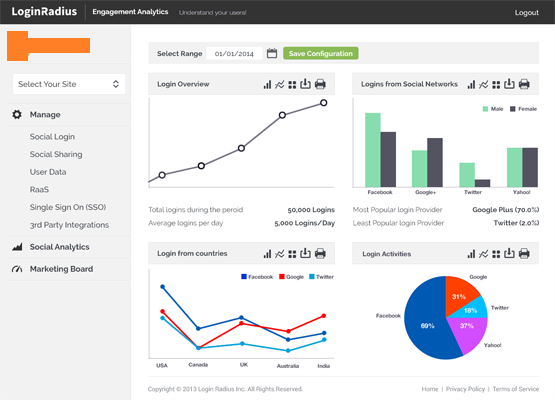 As I’ve mentioned early, you can track social engagement analytics and your business might grow viral with LoginRadius. Social media plays a key role in every business and I feel that it is good to have LoginRadius social login to increase your user engagement and traffic to your website. What is your view on this prominent social integration tool to implement social login to websites? Do you wish to use LoginRadius for your blog/website? Do leave your insights through your comment. You’ve presented a beneficial content for the bloggers/website owners! I read about LoginRaduis in some popular blogs and here I could get its key details. Social login is really indeed in today’s world as social networks plays a prominent role for business professionals. Implementing social login through LoginRadius seems worthy, I’ll have a try with it. Thanks for coming up with a detailed post of LoginRadius, hope it would help your readers to facilitate the social login for their blogs/websites. Nirmala recently posted…Don’t be a Copycat blogger! How good is LoginRadius’ freee trial? Is it better to just go with the paid version? Paid option is really better. I’d never heard of Loginradius before this, though on certain sites they do ask us to login using our social media profiles, so perhaps it’s this same thing though we don’t get to know about it. I think it is a great way as you don’t have to fill in forms or remember your login ID and password, especially with so many place you visit, it all becomes very tough. I like the idea of the social share buttons too and I think I would surely read more about it and check it out – just in-case it’s something I might plan using later. Presently CommentLuv rocks! LoginRadius is excellent plugin which is also compatible with BuddyPress. I am using it on few of my projects. Hello Aitsh – I agree with you that people intend to move way when we present them with a lengthy form asking too many data elements. The registration conversion will be high when the process is kept simpler for the user. Thanks for this in depth review on LoginRadius. I will give this service a spin and check how it works for my needs. Thanks for sharing. This system is cloud based? That’s really nice. The thing I liked most about this plugin is that it shows the analytics data of social shares I’m definitely gonna try LoginRadius on some of my WordPress based websites. Thanks for the share Atish.